WATCH: Willie Nelson's "Hobbit" Audition Revealed by "Conan"
The "Team Coco" video reveals Willie Nelson's mock impersonation of Gandalf the wizard. Conan O'Brien revealed a special video on his show's YouTube channel, "Team Coco," for Willie Nelson's 80th birthday. 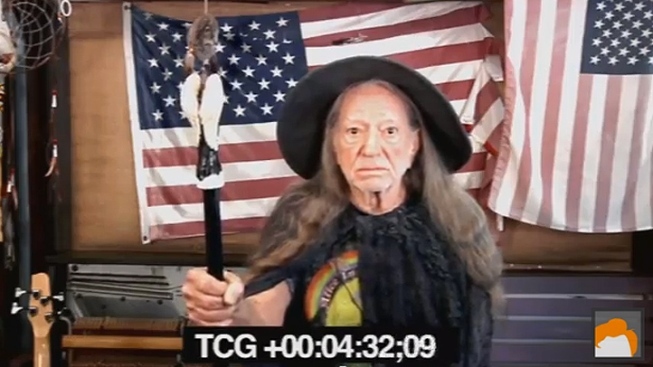 The video showcases a reel with the country musician's fictionalized audition for the role of the wizard Gandalf in "The Hobbit 2." In the spoof presentation to Peter Jackson, Nelson advocates smoking marijuana and snarkily mangles the character's lines. Ian McKellen, who plays Gandalf in the real "Lord of the Rings" series, responded on Twitter, "Dear Willie, You are far too young to play Gandy. But nice try; have a stoner of a birthday. Love and admiration."